Spring is in the air, but there is still a bite of cold out there at the minute. This week I have got some simple, but delicious delights that you can whip up very easily that will have everyone at home looking for more. Everybody loves a homemade scone and there's no better time to have one than when they are warm straight out of the oven. Scones are so easy to make and here is my recipe for what I think is the perfect scone, it will make about 12 scones. They are so simple and cheap to make you'll wonder why you every bought shop made scones before. Firstly, sieve the flour, salt, and baking powder together in a bowl. Then rub in the butter with your fingers until you get a light and crumbly consistency, and then add the fruit, and sugar. Mix in the eggs, and milk together with a fork, before you add the dry ingredients and mix until it forms a dough. Then roll out the dough on a floured table, and cut the scones with a cutter. When you have that done bake them for ten minutes at 200C and that is it. Quick and easy to make, and most importantly they are delicious. My second recipe this week has an Irish twist to a classic dessert, which is also very economical to make, depending on how much alcohol you put into it. This recipe will make enough for four people. You can make this in a small pie dish and cut into 4 bits when it is cooked or you could use 4 individual ramequins, whatever you have handy. Cut the crusts off the bread and cut into little triangles and neatly arrange in the pie dish with the sultanas. Then pour on your Baileys and let it soak in for an hour. The amount of Baileys depends on how boozy you want to make it. Next whisk up your eggs with the sugar and the vanilla essence, then warm the milk and pour it onto the egg mix, whisking all the time. When you have that done, strain through a sieve onto the bread. Sometimes I would grate a bit of nutmeg on top if I have it, to give it an extra bang. Have your oven heated to 160C and put the pie dish into a roasting tray that is half full of boiling water and cook it slowly in the oven for about 45 minutes, don’t let it burn, it should be golden brown. Then serve, with some ice cream if you wish. How easy is that? This is what I think is the easiest recipe ever for an apple pie. 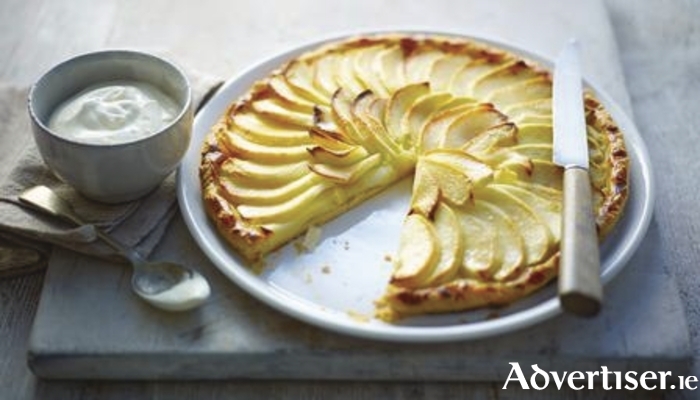 All you need is a sheet of puff pastry, which you can get easily in any supermarket, and some pink lady apples. Traditionally, we use cooking apples in an apple pie, but this is a different twist that I saw on TV last week, and tried it at home and it’s delicious. First, roll out your pastry and cut out a large circle, the same size as the bottom of a cake tin. Place the pastry on the tin and butter it all over. Slice the apples and place on top of the pastry in a circular fashion until all the pastry is topped with apples, then brush with butter, sprinkle a bit of brown sugar on top and into a hot oven at 180C for about 12 minutes, or until the pastry has risen and if fully cooked. Then serve it warm with fresh cream or vanilla ice cream. Can you beat that, an apple pie cooked from start to finish in under 15 minutes, that is so tasty and easy, you will have to give it a go. If anyone out there would like a recipe for anything at all, you can contact me on my e-mail [email protected]. Talk to you all next week.